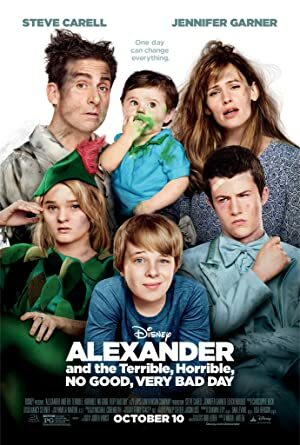 Alexander and the Terrible, Horrible, No Good, Very Bad Day (2014) – What's New on Netflix Canada Today! For 12 year old Alexander Cooper, everyday is a bad day. And his family thinks he’s being silly because they never have a bad day. On the day before his 12th birthday party, he learns that another boy is having a party of his own and everyone is going to it. And another kid punks him online. So at midnight of his birthday, he wishes that his whole family can have a bad day. And things for the whole family go bad, his mom’s car is broken so they have to share a car, his sister has a cold and has to go on stage, his older brother, who’s hoping to get his driver’s license and to bring his girlfriend to the prom, has to deal with his girlfriend’s snootiness and fails to get his license, his mom has a crisis at work which could cost her her job, and his dad who has a job interview has to bring his younger brother with him but because his pacifier is broken he can’t stop crying. Alex feels responsible. Alexander's day begins with gum stuck in his hair, followed by more calamities. However, he finds little sympathy from his family and begins to wonder if bad things only happen to him, his mom, dad, brother and sister – who all find themselves living through their own terrible, horrible, no good, very bad day.